DONETSK, Ukraine -- Alexandr Bednov was a prominent rebel fighter and the leader of a pro-Russian militia, the Batman battalion, in eastern Ukraine. Alexandr Bednov was known as Batman. 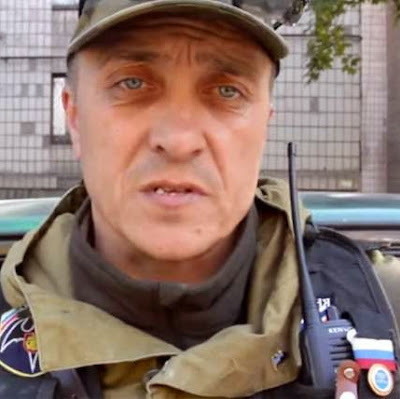 Alexandr Bednov, the leader of a pro-Russian militia called the Batman battalion in the eastern region of Luhansk, was wanted for murder, abduction and other abuses. Ukraine security council spokesman Volodymyr Poleviy confirmed Bednov's death but would give no further details. However, the website of the separatist Luhansk People's Republic said he was killed on Thursday by security forces. Bednov, who used to work as a reserve officer for Ukraine's Ministry of Internal Affairs and was married with two children, claimed to have been working to restore law and order in the region with his squad. In an interview with a blogger in November he said he had decided to fight for the rebel cause after witnessing rebellion in the capital, Kiev. He said the overthrow of the pro-Russian administration had been "served with a sauce of severe Russophobia, racial hatred, fascism, Nazism, the superiority of the Ukrainian nation over all others". He said his rebel army had been called on by people to restore peace to the region and dish out justice, even claiming to have reformed alcoholics by putting them to work digging trenches. On Friday, Ukraine reported its first military death of 2015. The soldier was killed and five others wounded in a gunfight with rebels in the city of Donetsk. Ukrainian military spokesman Colonel Andriy Lysenko said forces were generally abiding by the terms of the September ceasefire in a conflict which saw more than 4,700 killed last year. The authorities and separatists exchanged hundreds of prisoners of war at the end of December as part of a 12-point plan to end the conflict. Ukrainian President Petro Poroshenko is preparing to meet Russia's Vladimir Putin and the leaders of France and Germany on 15 January in Kazakhstan for discussions. Missing from the above blog are some vital pieces of information. Batman (Alexander Bednov) led a rapid-reaction force of pro-Russian militants which operated out of an LPR building, the basement of which contained a prison known for horrific torture. The prison housed 20 prisoners who were regularly subjected to torture. It is very likely that (at long last) we are beginning to see Ukraine's special operations (spetsnaz) troops beginning to wreak out justice. We will probably be seeing more of these.